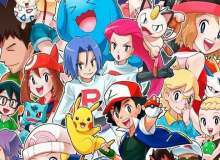 How much do you know about Pokemon anime? Pokémon is an ongoing animated show that follows the adventures of the series' main protagonist Ash Ketchum and his friends. There are entirely over 20 seasons and 1000 episodes! As it is based on the Pokémon game series, the anime deals with a lot of the same material such as locations, Pokémon battles, Gym Leaders, and Badges. LET US SEE HOW MUCH DO YOU KNOW ABOUT THIS ANIME!!!!!!!!!!!!!! In which region does Ash catch an Aipom? Which one of these characters traveled with Ash for the longest? Who did Ash lose to in the Johto league? Which of these Ash's Pokemon is yet to defeat a legendary Pokemon? Which of these Poke-girls has NOT yet owned a water-type starter? Among these Ash's rivals, who owned a Hariyama? In which of these Pokemon leagues, Ash finished Top-8? Which one of these Pokemon did team rocket(Jesse&James) NOT own? When did Ash last use Charizard in a Pokemon battle? In which region, Ash didn't catch a grass type Pokemon? Which of these Pokemon evolved in a region other than the region it was caught in? Which of these Pokemon has seen most regions? Which of these Pokemon has Ash never owned? Quiz topic: How much do I know about Pokemon anime?